Fall time is here! I love this time of year. I had a whole bin full of tweed stripes yarn that I use for my mermaids. I kinda went crazy buying it last year so I thought it was time to use it for something new! I had you all pick from three color ways on Facebook and Instagram. You mostly voted for the fall colors as opposed to the brighter colors! So I'll save those for another time! This yarn is one of my favorites! 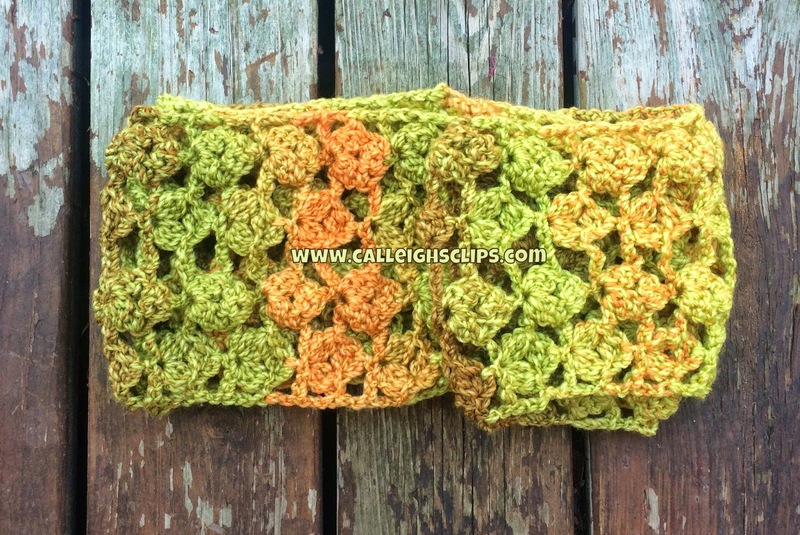 It's not worsted but it's not super bulky! The color ways are all gorgeous! I love the soft shades of green, orange, yellows and browns. 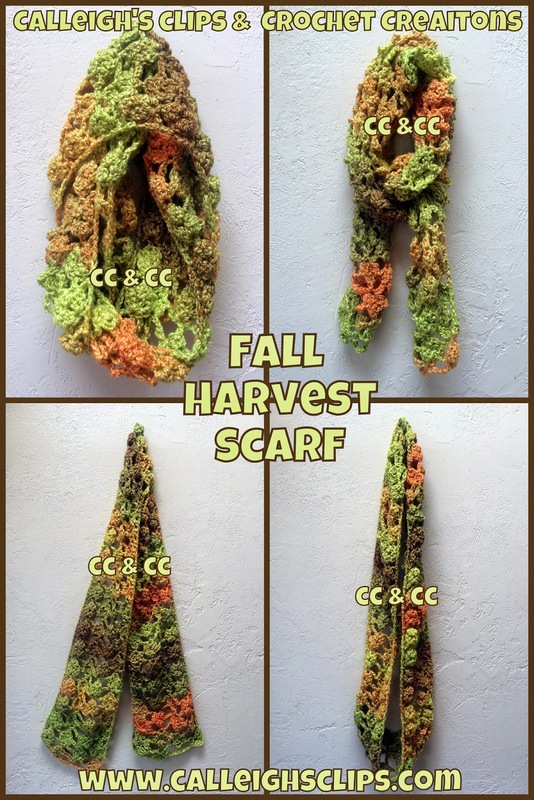 I designed this scarf so that you could either make a scarf to tie any number of ways or you can join it at the end to make a cowl that can be wrapped a couple times! It's got a unique open design yet is nice and snuggly! Sorta reminds me a leaves blowing in the wind! 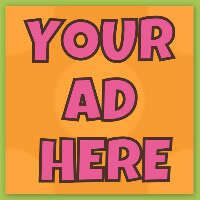 Please this to your Raverly, Pin It for later or make one right now!! *2-dc Cluster (uses one ch), *YO, insert hook in ch indicated, YO and pull up a loop, YO and draw through 2 loops on hook; repeat from * once more, YO and draw through all 3 loops on hook. *3-dc Cluster (uses one st), *YO, insert hook in st indicated, YO and pull up a loop, YO and draw through 2 loops on hook; repeat from * 2 times more, YO and draw through all 4 loops on hook. See New Video Tutorial to help get you started below the pattern. Row 1 (Right side): Ch 22, work 3-dc Cluster in fifth ch from hook (4 skipped chs count as first dc and 1 skipped ch), ch 3, work 2-dc Cluster in third ch from hook, work 3-dc Cluster in same ch as last 3-dc Cluster made, ch 4, skip next 4 chs, dc in next ch, * ch 4, skip next 4 chs, work 3-dc Cluster in next ch, ch 3, work 2-dc Cluster in third ch from hook, work 3-dc Cluster in same ch as last 3-dc Cluster made, ch 4, skip next 4 chs, dc in next ch; repeat from * across to last 2 chs, ch 2, skip next ch, dc in last ch. third ch from hook, work 3-dc Cluster in same dc as last 3-dc Cluster made, ch 4, skip next ch-4 sp, dc in next ch-3 sp, * ch 4, skip next ch-4 sp, work 3-dc Cluster in next dc, ch 3, work 2-dc Cluster in third ch from hook, work 3-dc Cluster in same dc as last 3-dc Cluster made, ch 4, skip next ch-4 sp, dc in next ch-3 sp; repeat from * across to last 3-dc Cluster, ch 2, skip last 3-dc Cluster, dc in last dc. For Cowl - Fasten off, leaving a long tail to sew ends together. Match Row 1 to Row 71 and whip stitch ends together or preferred method of joining. 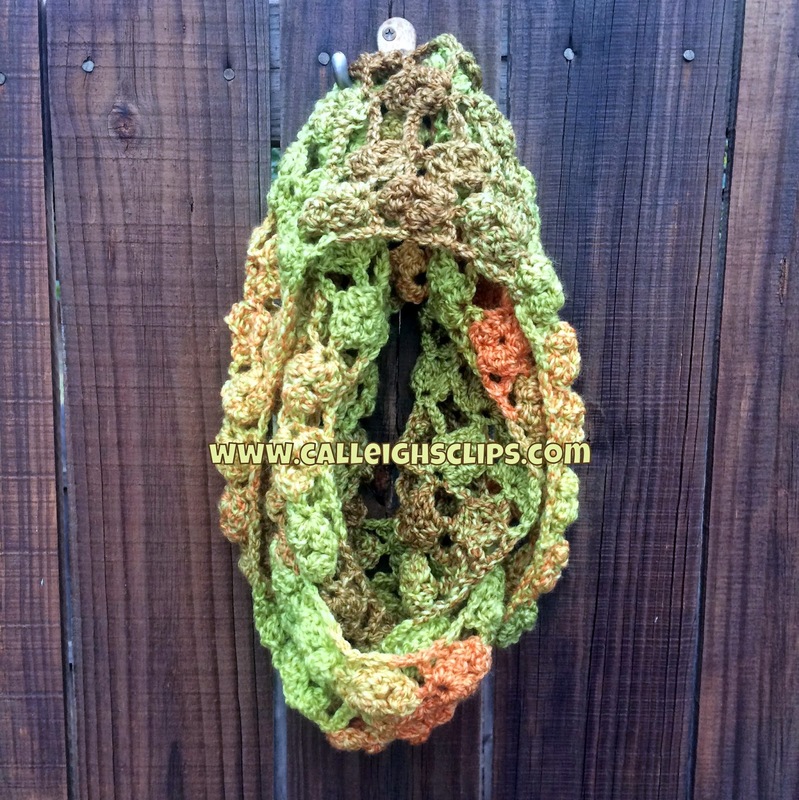 Video Tutorial for Rows 1 & 2 of the Fall Harvest Infinity Scarf! I hope you enjoy this pattern!! Who says crochet designing isn't dangerous! 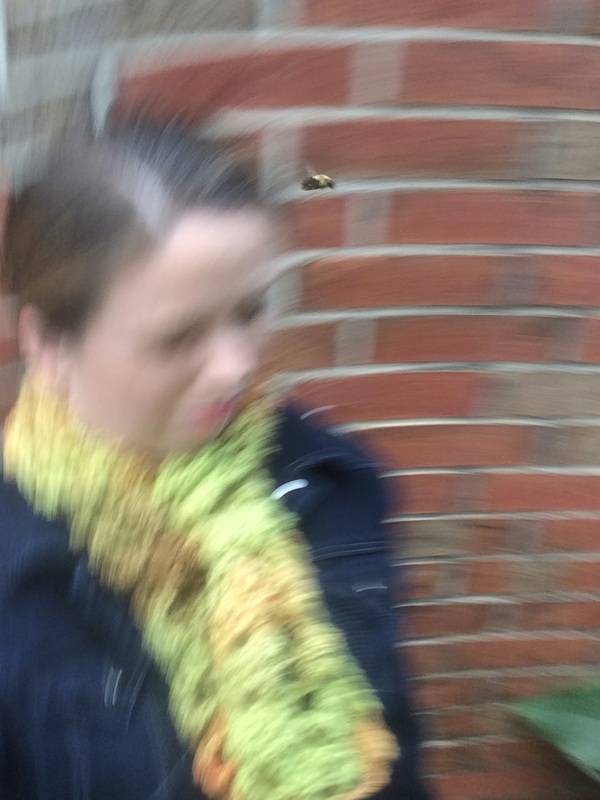 I was trying to get a selfie of myself wearing the scarf but this bee had other plans! I didn't even know I got this picture. I was moving away quickly when I heard the buzzing around my head. Do you see it? CRAZY! I'm fine but you'll notice I didn't get any pics of me this time. Pretty colors and pattern! I love infinity scarves! Oh Yes, those selfies can get crazy! Beautiful! 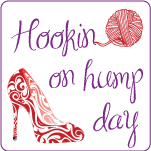 I have some gorgeous yarn perfect for this! Thanks for sharing! Wanted to make this so much. 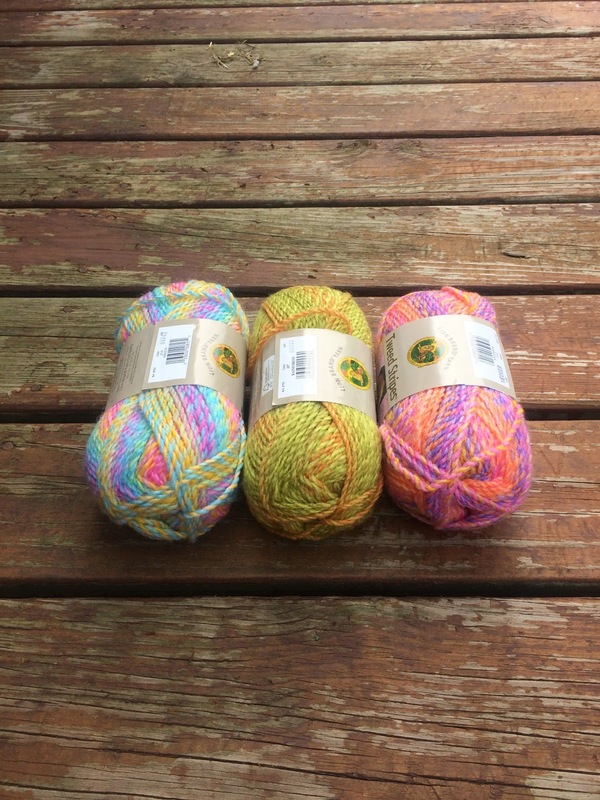 When I finally got the yarn (Rainforest, which is discontinued BTW and at $+), I am having a hard time with this pattern. I don't think the 23 chains work for the pattern and chained 27 instead. So far so good, now I am completely stumped on row 2. Which dc is the first dc? The one directly below the chain 3 or the first dc in the first 3 dc cluster? Then after that, it states to ch 4, skip the 1st ch 4 space and dc in the next ch "space", then skip the next ch 4 space. there is only 2 spaces between the clusters. Can anyone help me with this? Elisabeth, It's Bonnie again, see comment above. I made this scarf and LOVE it. Like you say in your video, it is light weight, but WARM. I started to make another pattern scarf with Tweed Stripes and it is too bulky cause of the way the pattern is, even tho I made it narrower. So I decided to make your scarf again using the colorway Woodlands and since I have about 4 other colorways of Tweed Stripes, might make it again in those colors, particularly the red (berries) and the purple (grapes). Did you make anymore in another colorway? I had to come back and view the video again to make sure I had the pattern right. I have this blog bookmarked. Thanks for the video, not sure I thanked you originally, much appreciated!